“This legislative session, PSC members delivered more than 13,000 messages to legislators in Albany demanding fair funding for CUNY. Members rallied in the Capitol, at the Governor’s Office, on CUNY campuses, and in the streets of New York. I applaud their commitment to our students. Together with CUNY students, the members of the PSC suffer daily the consequences of the State’s policy of underinvestment in CUNY: academic departments cutting course offerings, college libraries cutting hours, and adjunct faculty continuing to be paid poverty wages. While the budget agreement reached by the Assembly, the Senate and the Governor includes some important advances, especially on community college base aid, it makes little progress on addressing the fundamental problem of diminishing public funds for CUNY. As a result, the hollowing out of CUNY will continue and the opportunity for college completion for CUNY students will be at risk. The PSC welcomes the important increase in State funding for community colleges, of $100 per full-time-equivalent-student. These funds will help to provide desperately needed resources for CUNY’s seven community colleges. The PSC also appreciates the advocacy by the Legislature that resulted in restoration of funds cut in the Executive Budget. Vital funds for SEEK and College Discovery have been restored, allowing these programs to continue their remarkable record of changing students’ lives. In addition, we acknowledge the $2.5 million in additional funding for CUNY’s celebrated ASAP initiative. And the enactment of the José Peralta NYS DREAM Act, supported by $27 million in new funds, is a landmark achievement. The PSC has vigorously supported the DREAMers, and we are proud that the passage of the bill will make financial aid available to thousands of CUNY undergraduates. 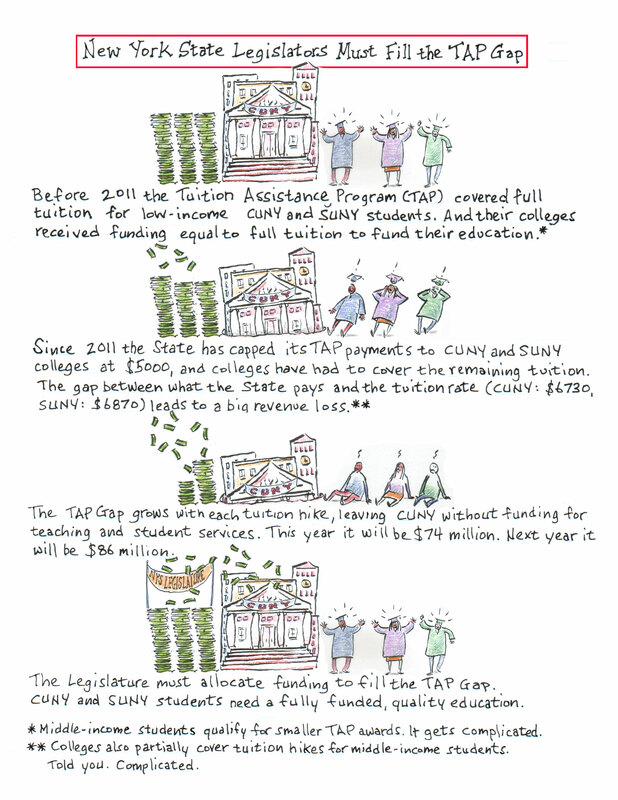 But the enacted budget contains no State funding for the PSC’s priority: closing the TAP Gap—a shortfall of millions of dollars at each CUNY senior college caused by the tuition colleges must waive for students receiving TAP awards. The gap at CUNY is already $74 million and will grow to $86 million next year. With no progress made on closing the gap, CUNY students will face deepening shortages of courses, resources, and time with faculty. It also includes no funding to increase the number of full-time faculty and counselors, and no dedicated funding to end the near-poverty pay of the majority of CUNY’s faculty, who are adjuncts. PSC members will redouble our advocacy through the remainder of the Legislative session as we continue to work with the Senate, Assembly and Governor to achieve adequate funding for CUNY and a fair collective bargaining agreement. The PSC will also continue the hard work of building our union’s power in the legislative districts and the workplace. In alliance with CUNY students and community allies, the PSC will continue to organize for the public funding needed to make CUNY the university its students deserve."